Cane Corsos become quite attached to their family, especially to the children. They are playful and protective, yet seem to be aware of the child’s helplessness and innocence. However, as with all dogs, parents need to be vigilant to make sure both the child and dog learn how to interact with each other. They love being included in family activities such as hiking, jogging, long walks, swimming, bike riding or playing fetch. They are generally quiet dogs, usually only barking to alert to strange situations. Cane Corsos should be socialized starting at a young age because they never back down from a fight. They are instinctively a guard dog and tend to stay on guard. They seem to instinctively know when to be protective and are able to judge character to discern friend from foe. They make an excellent companion as they are smart, protective and loyal with an ease of adapting to new things. 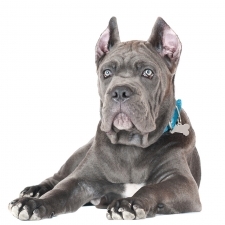 Cane Corsos usually weigh between 88 to 110 pounds and stand approximately 23 to 27 inches tall. They are a large dog with a powerful build. They have a short, dense coat that usually comes in black or fawn. Cane Corsos can live as long as 10 years. Common health issues include hip dysplasia and eyelid problems like “cherry eye.” The Cane Corso is also prone to bloat. Feeding them smaller meals throughout the day will help control this. The Cane Corso is very easy to groom, needing only the occasional light brushing.